I wanted to share something with you guys that I did. For those of you with little gem and rock collectors, let me share this with you. I took a small plastic kids pool and filled it about half full of sand from a local gravel pit. I bought some awesome little gems from Wal-mart for $3.96 (small gems of different colors and sizes). 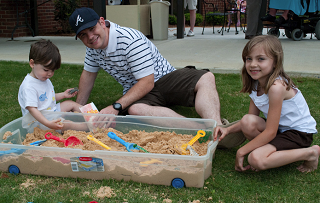 Put a small portion of the gems in the sand and stir them in, and the kids can have treasure and gem hunts all summer. Even the grown kids have been seen looking in the sand. I got some real plastic (Resin) fork and shovel from a local hardware store. Awesome fun for all, and it wasn't very expensive. SAFETY NOTE: This frugal fun tip is meant for over 3 years old. If your child is the type to still put everything in their mouth, best to wait till after 5 years old. This wonderful frugal tip came from Gladys Smith!